I'm excited to start a new series on here about the books that have "changed my life." That sounds probably more dramatic than it actually is, but in truth several books I've read this past year have had a dramatic effect on my life and I just have to share them with you. Some are on finance, some are on health, and some of my favorites are on personal development. The idea is to not just give you a book report, but to show you what I've learned, how I've applied it to my life, and how I'm still making it work long after I'm done reading the book. 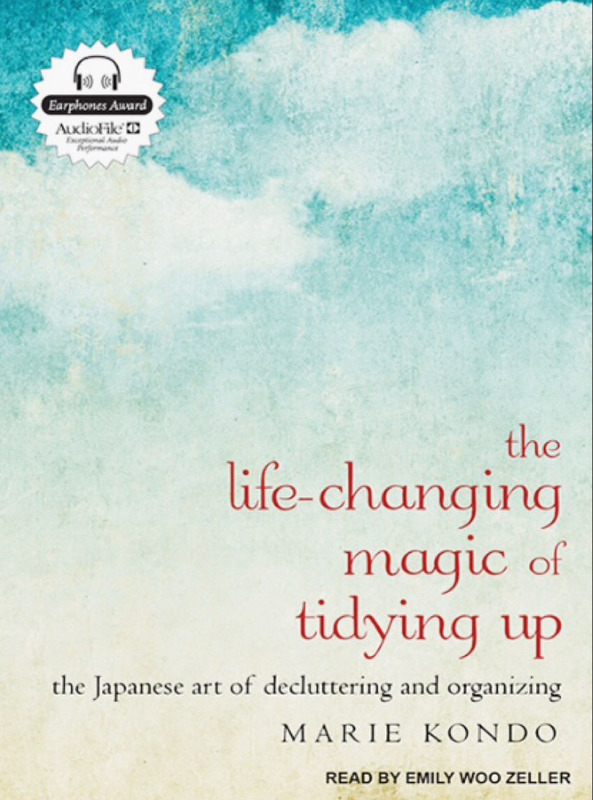 So let's get started with the first book in the series, The Life-Changing Magic of Tidying Up by Marie Kondo. 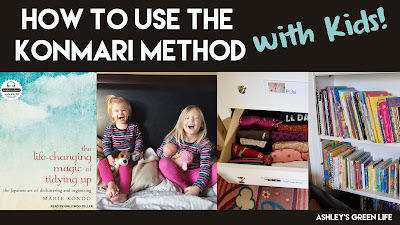 In an effort to keep my title short, I've gone with the "Konmari Method" which is the tidying method described in the above mentioned book, which was created by combining the authors last and first names together (Marie Kondo=Konmari). And for those of you who haven't read it, you may be thinking, "A whole book about how to tidy my house? That's weird. I know how to clean." 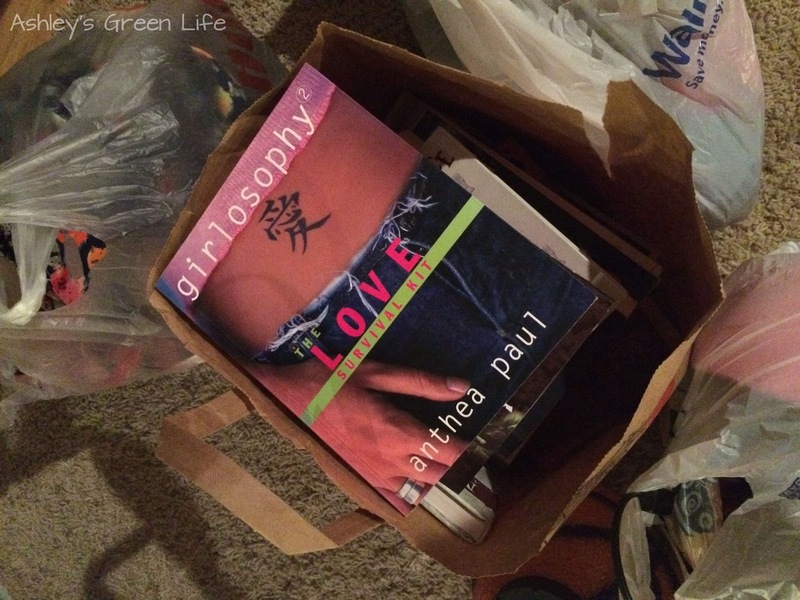 But the book goes much deeper than that and it takes everything you know about cleaning and discarding and throws it out the window...or in the garbage back as the Kondo would say. Kondo suggests that by tidying your home and removing all the items that do not spark joy and that weigh you down, you change the way you feel about your home, the space you spend most of your free time, and as a result it changes your life dramatically for the better. 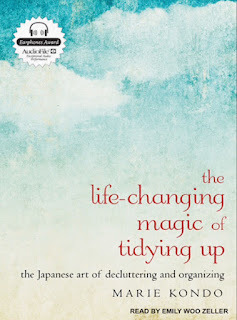 Now since I love to clean and organize, this book comes as a natural fit for me, but from the response it's getting world-wide and as Kondo describes in the book, her method is for all personality types and for those who complete her course (or the book) it is rare that they "rebound" back to their untidy ways. An interesting thing is that I thought I already had a cleaned and organized house. I had storage tubs in my basement with little labels and all my mementos were properly boxed away. But little did I know, just because something looks organized doesn't mean it's needed in the first place. 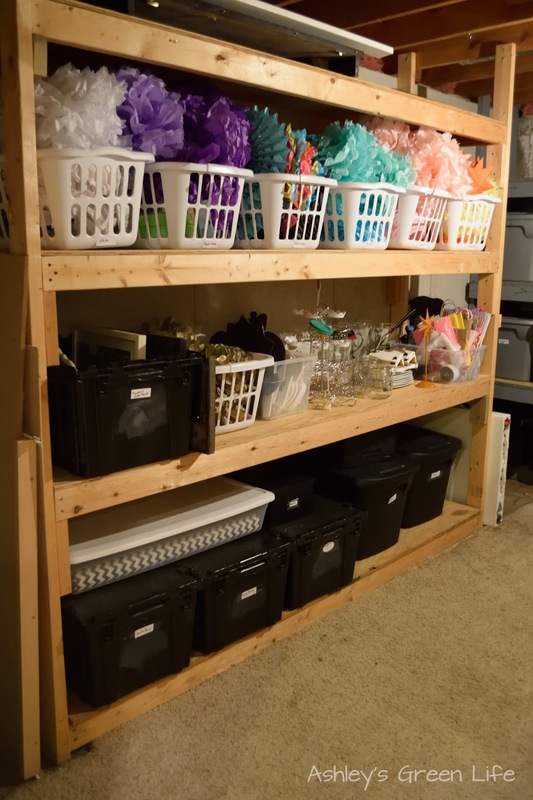 As a result of the Konmari Method I was able to empty over 15 storage containers! All items I thought I needed, things I had sorted, stored and packed away, but what I failed to do is think if I actually needed the item at all, and even more "did it spark joy?" When I first read the book I got a little overwhelmed with all the details of what to toss and what not to toss and how to fold or store certain items, but now that I've read it over and over several times, I now see the forest through the trees, and here's the basic premise: Tidying your home can be broken down into two tasks: discarding everything that does not bring you joy and finding a place for everything you do want to keep. That's it. In doing this order you save things you don't have a strong emotional ties to start with and as you work your way down the list, you hone your decision making skills and get better. Then by the time you're at mementos, often the hardest category to sort, you are better equipped to decide what to keep or discard. Now when going through each category, Kondo's method is different from any method I've ever tried before and I love it. What you do is take all the items from the category you're working on from around the entire house and put them on the floor in front of you. Then you pick each item up and decide if it "sparks joy". If it does you keep it. 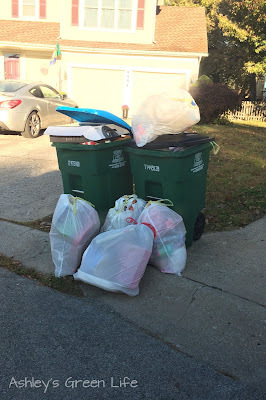 If you have to think about it or it doesn't spark joy, you discard it (trash, donate, recycle, etc.). Obviously there will be certain items like a dish scrubber or a toothbrush, that you'll want to keep that don't necessarily spark joy, but that are necessary to have, so those don't technically count. But if there's a routine item that you need for basic living/health routine purposes but you just can't stand it, maybe it's time to go buy a new one that sparks even just a hint more joy than the previous one. For example I had a ratty old door mat by my outdoor porch, and while I do need it to help my dogs from tracking tons of dirt into my house I didn't need to keep the old and worn one, so I went out and bought a new one that is more effective and pleasing to the eye. It's all about choices and choosing to fill your home with items that you feel good about, even from the toothbrush to the ratty door mat. If you have to look at them and use them daily wouldn't you rather be surrounded by objects that help you feel better, not worse? Okay now back to the discarding....once you've discarded all the items for one category, you then find the best storage solution that works for you. The key to this is that you give a home or a place to every item you own. 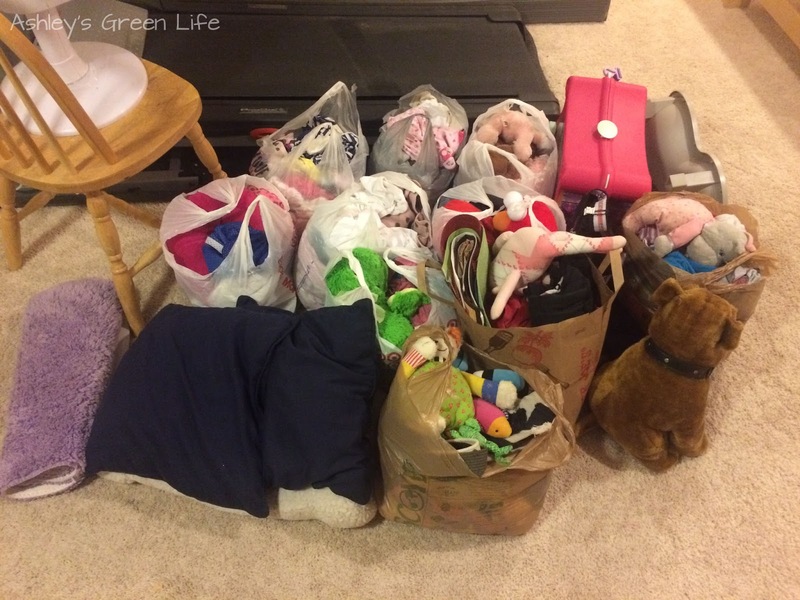 This was life changing for me because I had no idea, as you'll see below, just how many items of mine did not have a home and yet I was always frustrated that they were laying around on the floor or shelves making a mess. The biggest example of this was in my kid's toys. I was always frustrated that they weren't cleaning up their toys, but honestly I was unsure of where to put certain things like blocks, puzzles, pretend people, and stuffed animals, so then how would then know where to put them away? Well, the good new is that they do now! So now that you know the basic premise of the book I'm going to share my journey with the book and how it has truly changed my life and especially my home. One last thing Kondo recommended in the book about when you tackle your tidying and discarding and that is to have it be quiet, not with music or the TV in the background. Granted sometimes when I was cleaning and discarding my girls were around and the TV may have been on one or two times, but ideally it's best for it to be quiet. Kondo says that the quiet allows you to tune into yourself and really judge your reaction to an item to decide whether it sparks joy or not. And with the TV, music or my personal favorite, an audiobook, it's harder to really listen to that little voice within that says, "Get rid of it!" 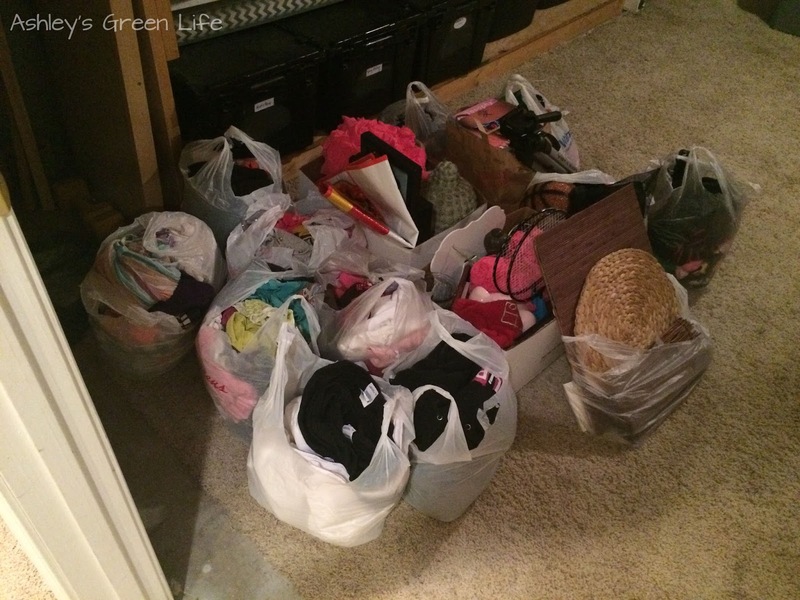 Just like Kondo suggests, I began my "Konmari Method" experience with my clothes and I did as she instructed and took them from all around my home (my closet and the off-season clothes I had in my basement) and placed them on the floor. I first sorted them by category and then I held each item and decided if it "sparked joy". 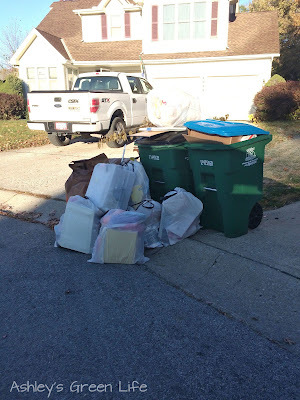 If it didn't it went into my donate or trash pile. This was so freeing to me because my closet was filled with items that had the best intentions to be there but for some reason or another I had no desire to wear them. For some it was because I didn't like how they fit (I have sensory issues with my clothes and can't stand uncomfortable tags or itchy material), or because I wore them when I was pregnant with my girls and now when I wear them I feel like I'm pregnant again, and for some it was just the guilt of spending the money on them that made it seem as though they deserved a place in my closet even though I didn't like them anymore. But with a new set of eyes and perspective from the Konmari Method I had no hesitation on what needed to stay and what needed to go and it felt so good to finally say goodbye to so many items of clothing that were no longer serving me. The pile of clothes to donate...buh bye! closet clothes I sorted by them by category (pants with pants, sweaters with sweaters) and within that category by color (darkest to lightest). 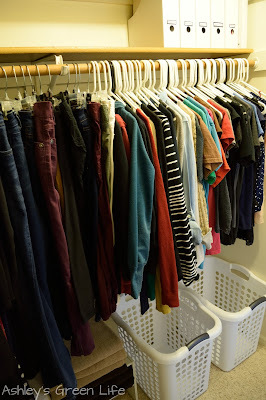 And then to add to that I had the clothes rise to the right (more pleasing to the eye according to Kondo) so I start with pants and dresses on the left and let my clothes rise to the right by getting shorter as it goes and then ending with frilly shirts and tank tops. 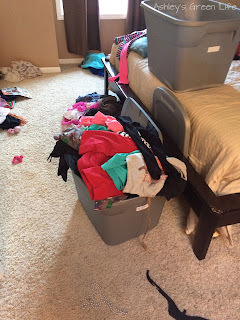 You can see how the clothes rise to the right. with other t-shirts, and frilly tops with other frilly tops. rise to the right theme. I also tackled my drawers and abandoned my old method of "this is the drawer for lounge wear tanks and tops" and "this one is for lounge wear shorts and pants" and from there I just toss it in. 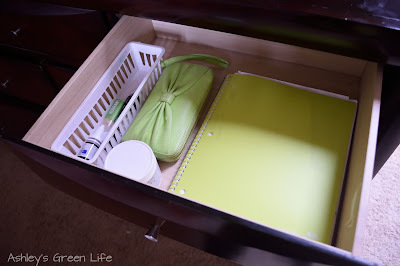 But learning the Konmari Method, I knew these drawers needed some help so I used some old storage containers to be dividers as well as old shoe boxes and divided up my clothes by category within the drawers and folded them according to the Konmari Method that I'll share more of in my girls' clothes post. Nonetheless, here's how it looks now. 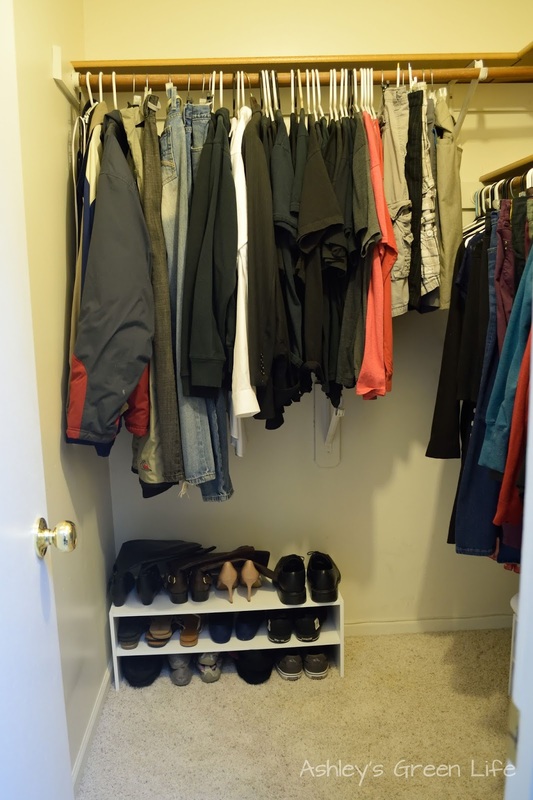 One last thing, I now put all my clothes, both off-season and in-season all in my bedroom in either my closet or dresser. 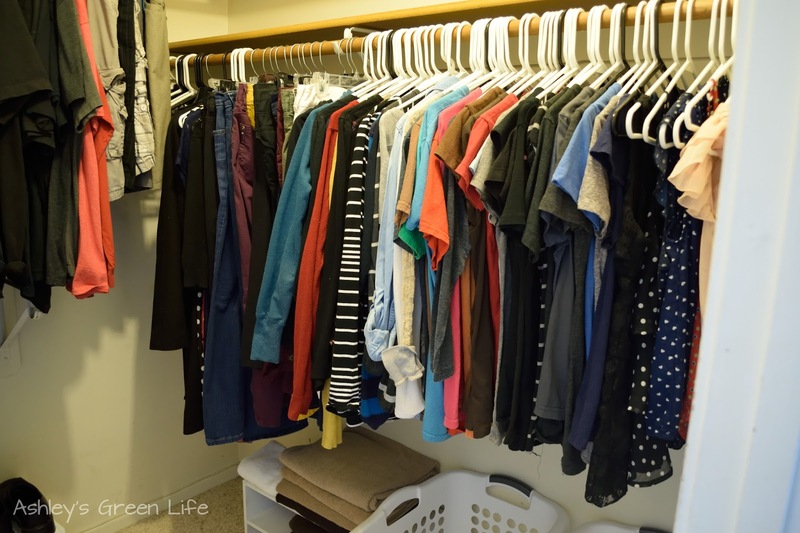 Kondo says that when we keep off-season clothes in storage and far away or even out of sight, we forget about them and sometimes when seasons overlap, we are late in trading out our clothes. Sometimes we end up buying new things and then when we bring out the other season of clothes we realize we already had it. 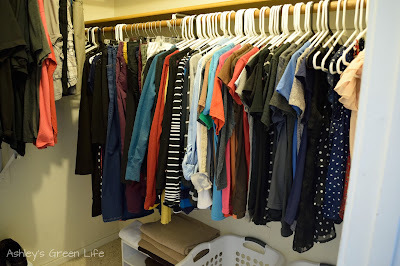 Personally I love that I don't have to spend a whole day swapping out my clothes and my girls clothes once the seasons change, and instead those clothes are close and nearby in case I might need them no matter what the season. This was a simple category for me because a lot of the books I read are on my Kindle, library books, or as audio books. Still I felt a certain attachment to those books that were on my shelf since I had a hard copy of them, but as Kondo says in the book, the books served you at one point or another in your life and now it's okay to let them go. And let them go I did, nearly all of them. 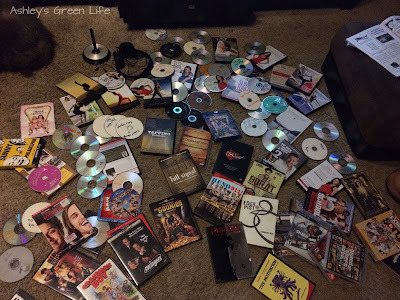 In doing this we were able to get rid of so many scratched, not watched, and no longer sparking joy DVDs. And it reminded me to take better care of my workout DVDs by keeping them in their cases, not just out to get scratched. 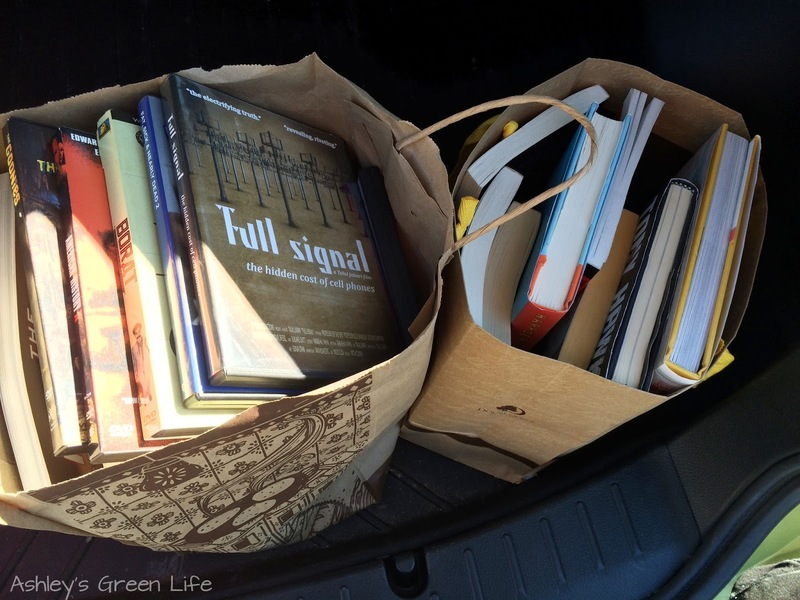 Here's the bags of books and DVDs to sell that were in good condition. 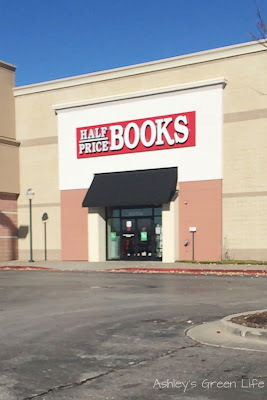 A cool place I found to take my books that were in really good shape was Half-Price Books, I took 2 small bags of 20 some books I'd say and got $30 for them! As for some of the others that weren't looking too fabulous or were a bit outdated, I took them to Goodwill. But my favorite part of the book tidying came from my girls' books. Be sure to check out their post to see just how I tackled their children's book library. Now I'd like to think I'm a paper organizing pro. Like Kondo, I've been orangizing and sorting objects, papers, and mementos since I was middle school and papers are one of my favorites. 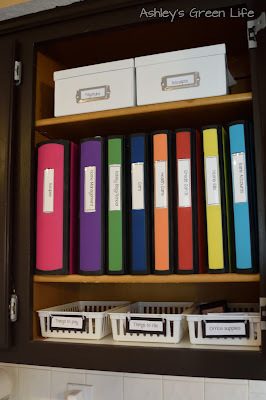 Just this summer I did a complete makeover of how we file our home papers (bills, important documents, etc.) 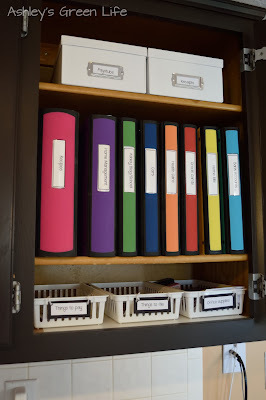 in how I went from using an old, broken filing cabinet in our basement that was hard to ever want to file things in to a new "command center" in our kitchen that contains binders for each category of papers. 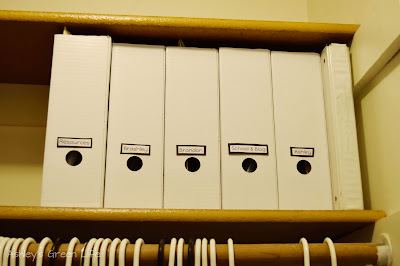 As you can see by the picture, I have binders for "Bank Accounts, Health Care, Home Management, Cars, etc." for my type-A brain this is great. And the color coding is just the icing on the cake. Here's a link to where I got the binders at Staples. Kondo on the other hand thinks you should toss 90% of the papers you own and store the ones you keep into a vertical filing system based on 3 categories: things you use often, things you don't use often, and things you have to keep. And not to "sub-divide" the categories...but I love to sub-divide! So within Bank Accounts, there's a file for my bank account, Brandon's bank account, etc. I just like separate things to be separate. Maybe someday I'll get tired of it and jump to Kondo's simple categories. Within this category I tackled some cluttered areas under the sink in my bathroom and in the drawers next to the sink. As she describes in the book, you take everything out, decide if it sparks joy or for these categories (is useful and I still like it) and from there, only store the things you want to keep. Next I tackled the drawers next to the sink. The first one has: toothbrushes and toothpaste, hair bows for the girls, brushes, and hair ties. 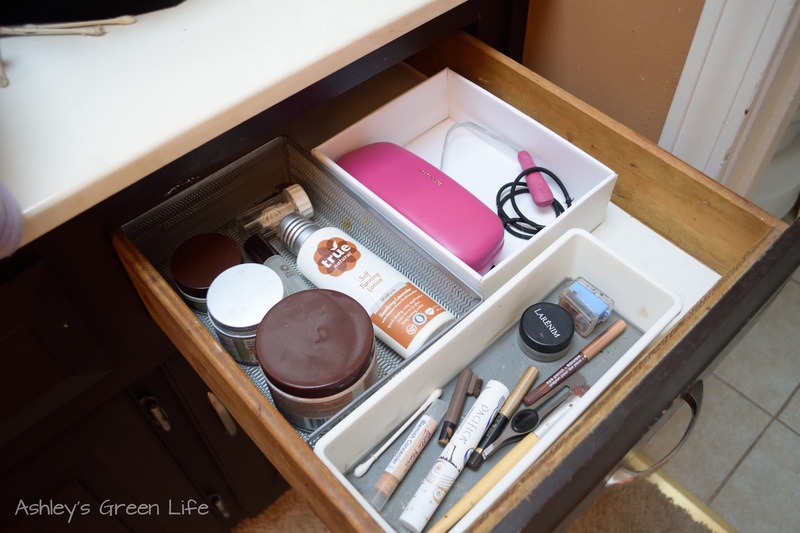 This drawer used to be a mess, so I love the cleaner version. My girls are even able to help me keep it clean since it's so easy to see where everything goes. 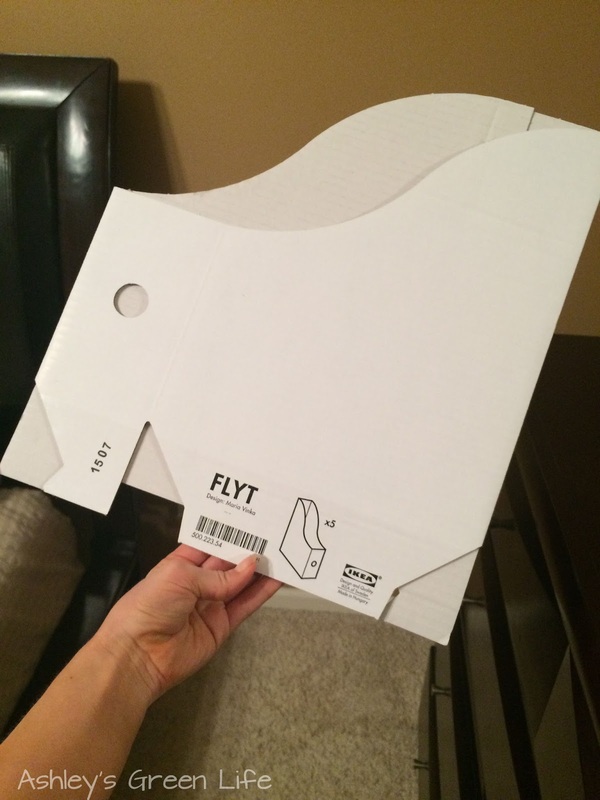 In case you're wondering, here's the trays I use to store them: big trays & little trays. 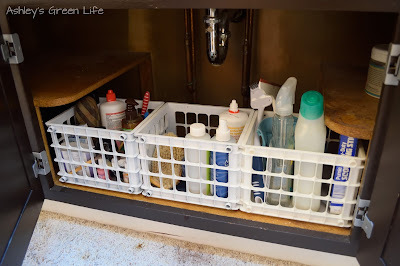 On the other side of the sink are my things and I used little storage containers or boxes to help keep the items divided. In here I store: face cream, eye cream, lotion and deodorant in one container, glasses case, tongue scraper, and hair ties in another, and all my make up in the last one. 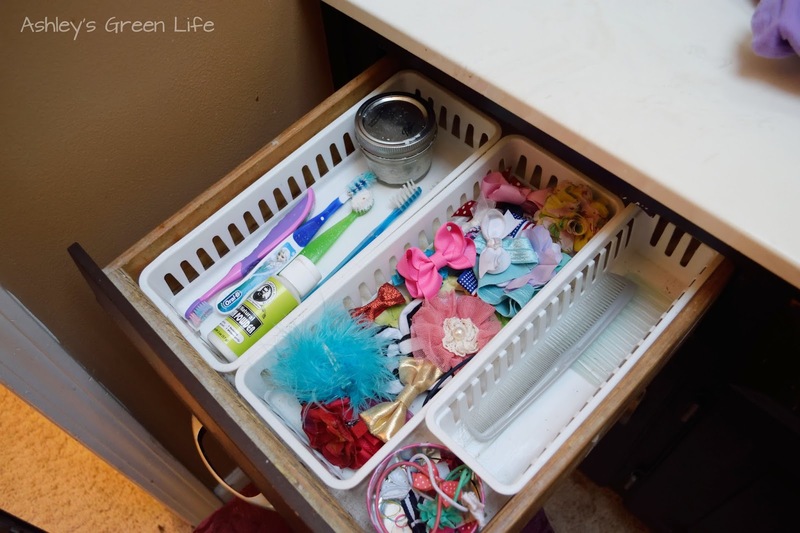 I repeated this same process to all the drawers in my kitchen too. And as I kept cleaning I kept finding change all over the house. Usually Kondo suggests the phrase, "Into my wallet!" 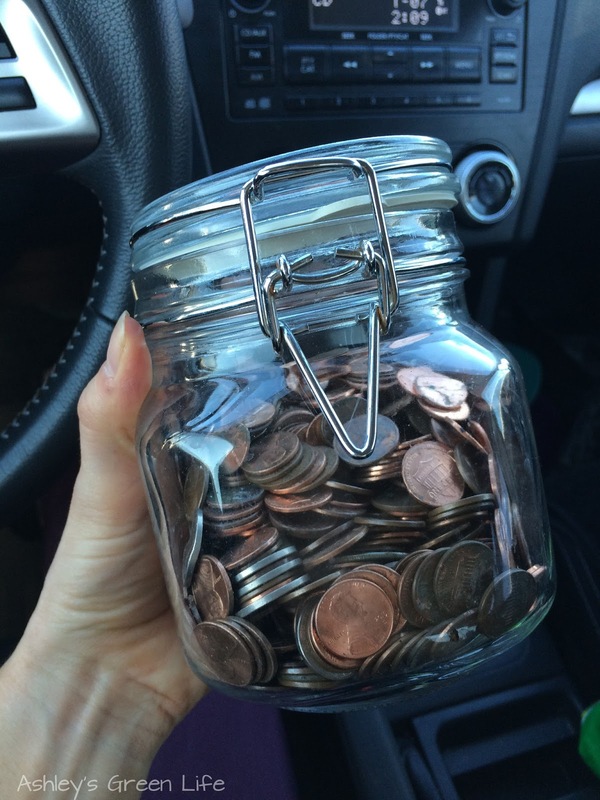 for spare change you find around your home, but to my surprise, we had quite a bit. So during this stage of the cleaning I loaded up all the change I had found into a jar and took it to a CoinStar machine. 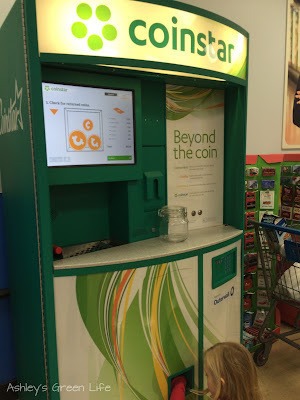 Avery helped me dump it in and get some cash back! We ended up having $15 in change. Again, sometimes cleaning up pays off! Kondo suggests you save this category for last because by this point in your tidying, you've strengthened your decision skills and you're better able to take on those sentimental items that might have slowed you down before. I know personally by this point in the tidying, I felt like a decision making ninja. Anything that came my way was quickly decided upon and either tossed or kept, without much hesitation. So whatever you do, save photos and mementos until the end. It will take you much less time for you to process them than if you started with them. 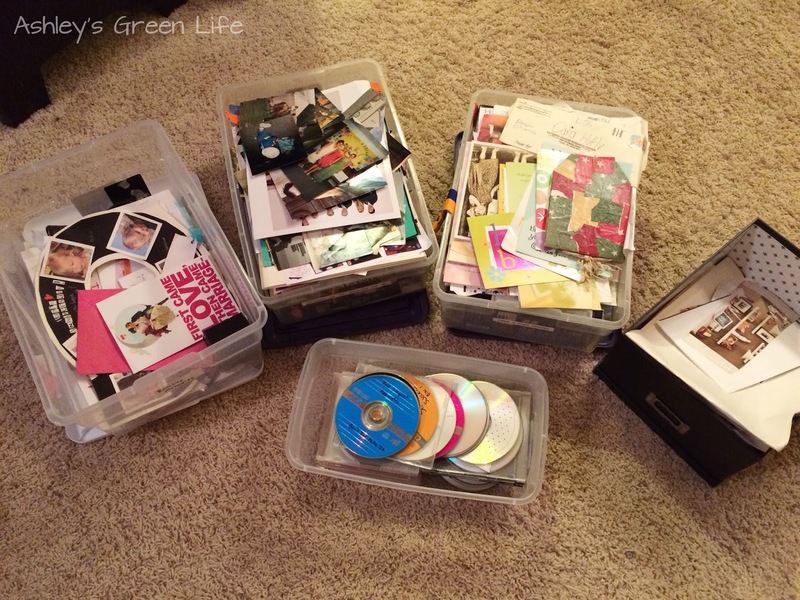 With that in mind, here's the photos, mementos, and even CDs that I had collected over the years. Some were my personal childhood photos, others were of Brandon and I, and some were even from my job as a teacher. Basically I went photo by photo and item by item and really thought to myself, "Does this spark joy?" Now some items I had kept for years so before I just put them in the "keep pile" I had to really stop myself, and say, "Yes you've had this forever, it's served you, but do you REALLY still need it?" And usually the true answer was NO, so I tossed it. 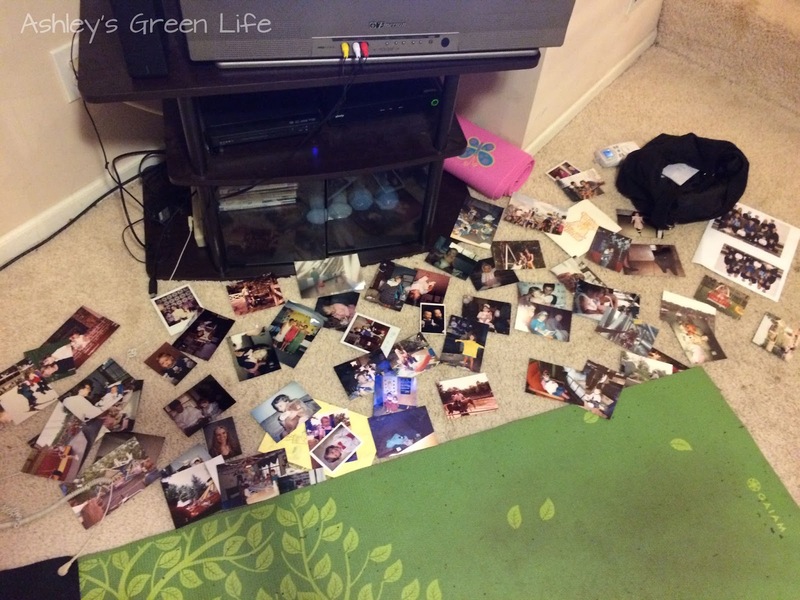 After my initial toss and sort, I even laid out the pictures I had chosen and sorted through them once again during one of my workouts, just in case I had missed some. End result? I filled nearly this entire trash can with old photos and mementos that were not serving me. Pictures of me with my "boyish" hair cut from 5th grade....goodbye! Why keep it? So I have to be reminded of it every time I go through my photos? No thank you. I remember that phase very well and it made me who I am today, but I don't need it anymore. The same went for old yearbooks, high school papers I was saving for some reason, and anything else that was not sparking joy. now I'm done with you. But then the question was "how can I store these pictures differently?" 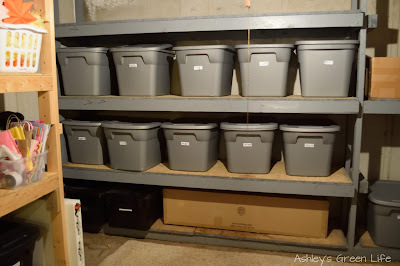 In the past I keep them in large storage containers, but those took up a lot of space and I had to trek all the way down to the basement to look at them. So I took a tip from Kondo and chose some vertical storage instead. By storing objects vertically, you can drastically decrease the space they take up, who knew?! But then you can pop them open and they are ready for storage. For my containers I decided to label them according to who's items were inside and to move the storage to my closet. As you can see from the categories I have a box for: Resources (things I'm interested in learning about or have read), Brashley (that's Brandon and I's funny celebrity couple name: Brandon + Ashley= Brashley ha ha! 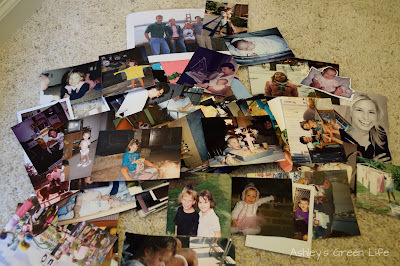 Really though this is all our little mementos as a couple), Brandon (his childhood photos and mementos), School & Blog (memories or special mementos from my teaching job or this blog), and last Ashley (my photos and mementos). 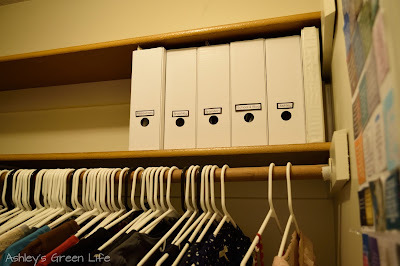 I love how little space these dividers take up in my closet and how they are close for easy access if I need them. 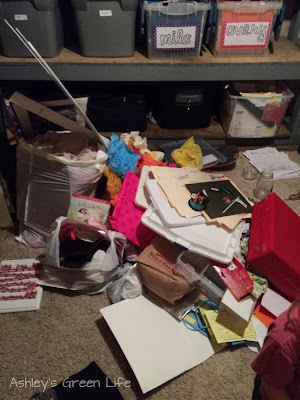 Now that we've gone through all the areas of my home that I tidied, here's a peek at what some of it looked like during the discarding process and the system I created for dealing with it. 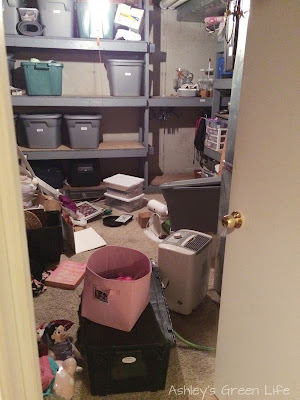 For me, my basement was my "dumping ground". It was actually a pretty clean and organized space before I started the book, but while working through all the categories I ended up with some large piles, such as: items to donate, things to throw away, stuff for me to take to school to donate, piles I still needed to get to, and even some stuff I didn't know what to do with it yet. 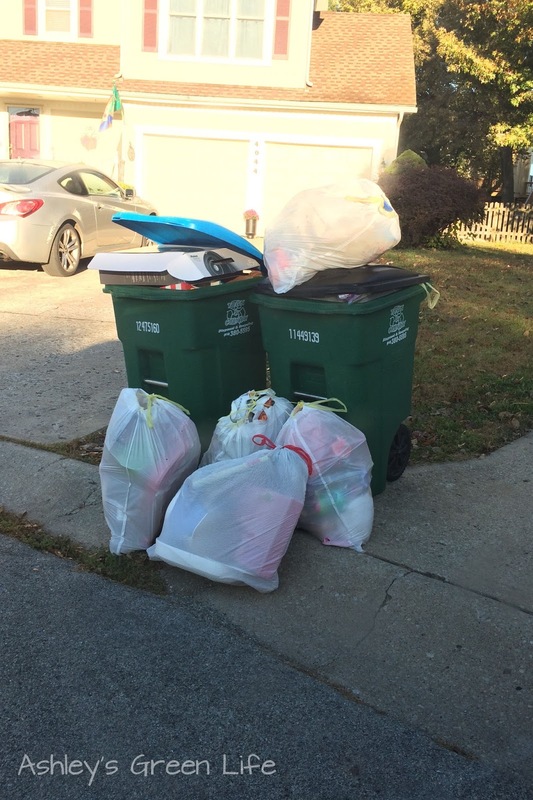 So keep in mind that you might find it helpful to have a designated place you can put/dump/store items while you are in the midst of your discarding and tidying marathon. This allowed me to keep the rest of my house clean while still doing the messy work that needed to be done "behind the scenes" so to speak. Luckily after all the piles had been thrown away, donated, or stored where they needed to be, order returned once again to my basement. And surprisingly, it was cleaner and tidying than before! 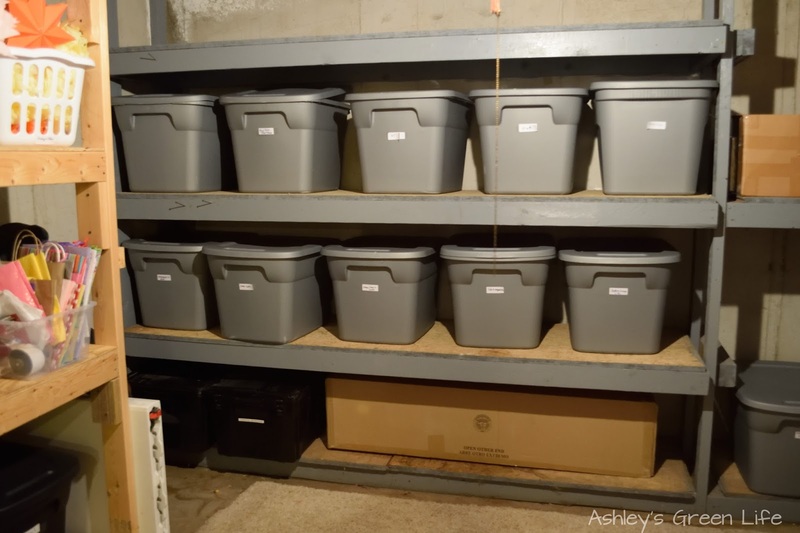 I had no idea how many items I had stored away in nice little storage containers, but when I really thought about it, I didn't need the item at all. This freed up a lot of storage space and storage containers that I was able to give to friends and family instead of having them take up space in my house. 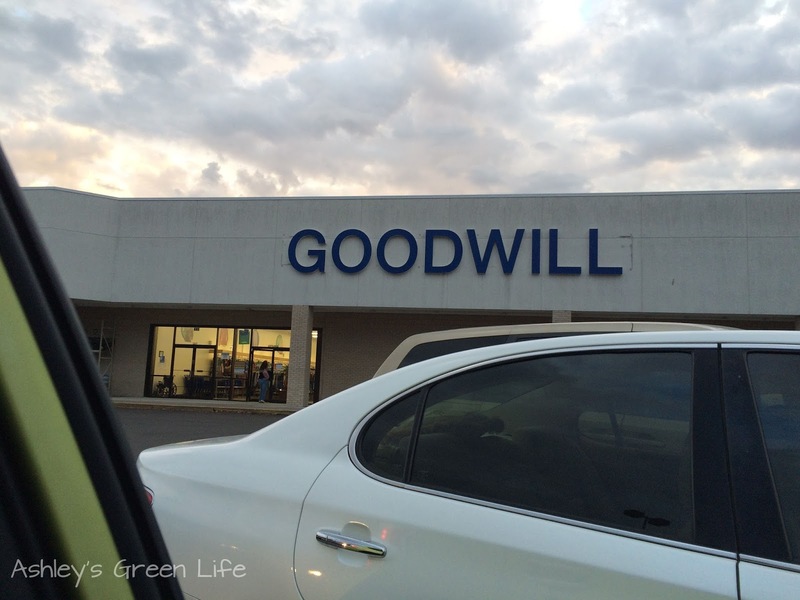 Now when it comes to where I took most of the things I didn't want, my go-to place was: Goodwill. 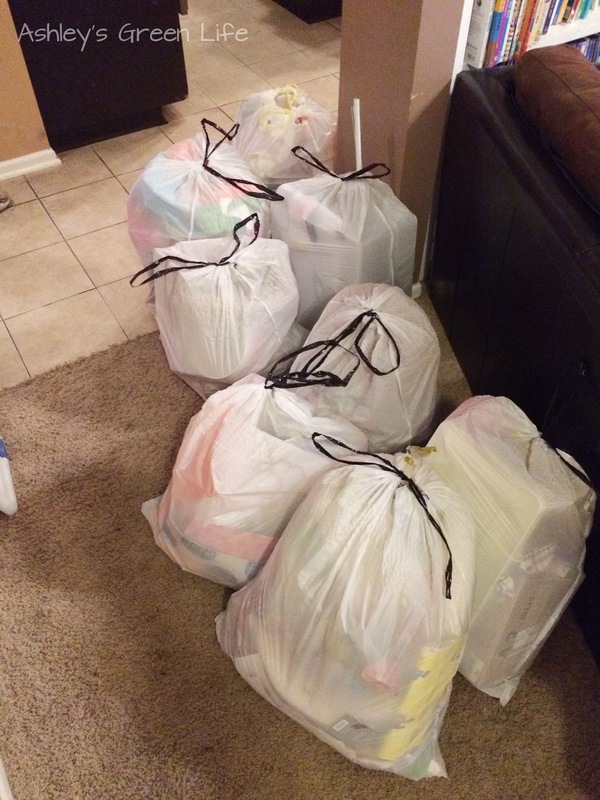 I tried taking some of my clothes to two consignment shops, but hardly bought anything (cue two shirts), so I took nearly all of it to Goodwill. 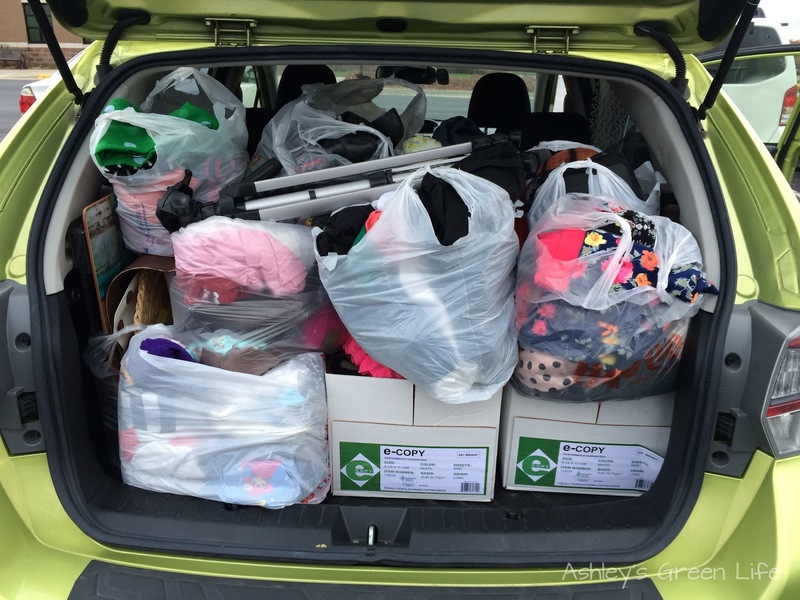 I love taking things here because it gives the items a chance to find a new owner that will appreciate them and it helps create jobs through the work of Goodwill. Talk about a win-win. 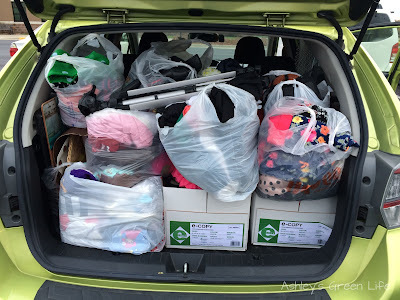 Here's the first load I took to Goodwill. 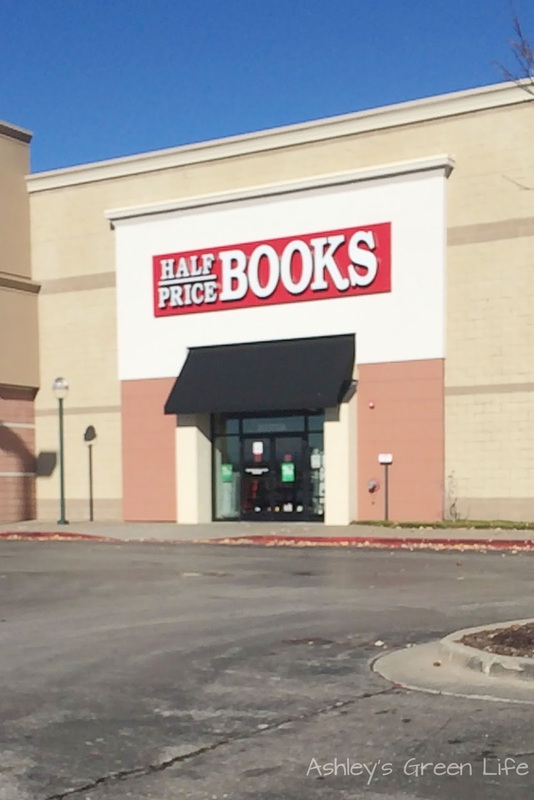 think they would buy at Half-Price Books to Goodwill instead. 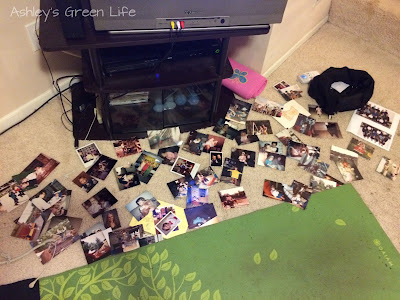 decor that was no longer sparking joy for me...goodbye! it all gone was priceless. I felt lighter and my home felt happier. 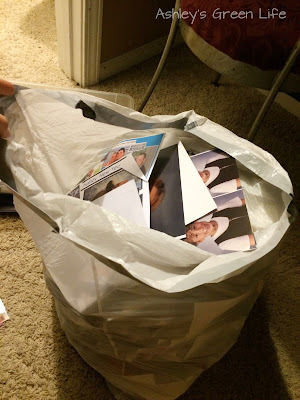 One last place I took things was right to my trash can. Bag after bag I filled with items that were torn, stained, broken, and that no one needed donated to them. 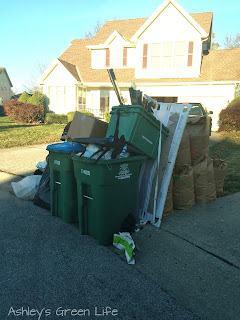 Now part of me, the green side, feels bad about sending all this stuff to the landfill. But if I can't donate it and it's not serving me in my home, why keep it around just for the sake of being green? That's not green at all to me. Goodbye mega load of trash! So now that I've completed my discarding and tidying my entire house I'm doing things each day to try and keep things clean and orderly, but it does take work. One of the biggest lessons I learned from reading the book was that everything in your home needs a place. This made me take a look at everything I own and wonder, "Does this have a place or a home?" For some items the answer was "no" like my purse. For years I've just set it on a counter when I get home, but Kondo is all about emptying your purse out everyday. Luckily I don't carry a lot in my purse so it's easy to empty it each day and then hang it on the doorknob to my closet. enough space leftover my journal/planner. Then my purse gets hung on the doorknob. And each morning I fill my purse back up and go on my way. It's funny after doing this for a month or so now, I just can't relax until I know my purse has been "unloaded" each day. 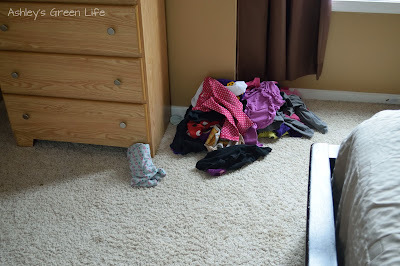 Now when it comes to keeping my house tidy, like I said, it's easier said then done. It's easier to say that you'll put everything back in it's place right after you're done with it. 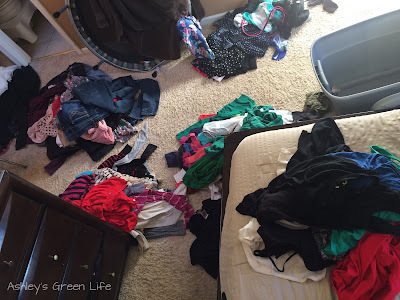 But there's one area that makes it hard for me and that is laundry. Oh that dang laundry just knows how to mess with me and even more, it's never truly done. 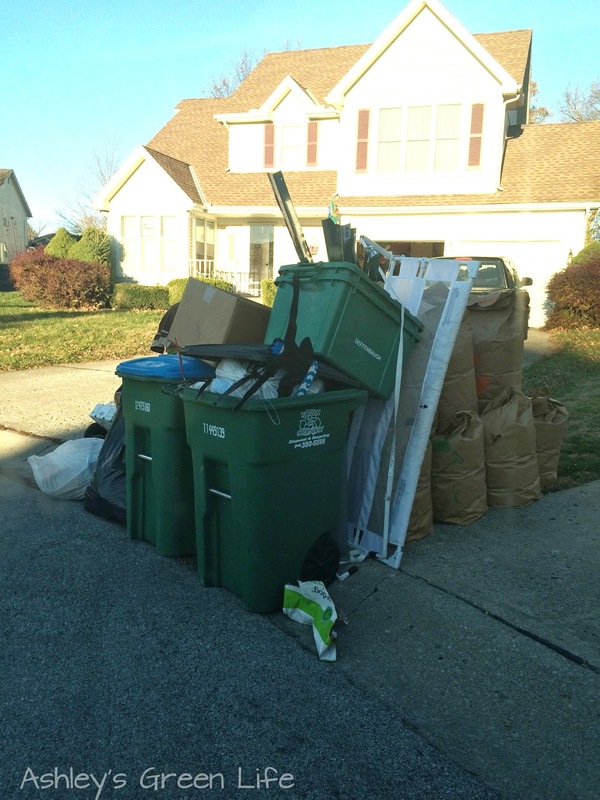 Just when you put one load away, another is about to be done and ready to be sorted too. Ugh. But it's a part of life. I suppose we might need clean clothes right?! So my system is to try and put my laundry away on a daily basis before I go to be, if needed. This helps keeps it from piling up. But truly I try to give myself grace and know that working a full-time job and having two young kids means my house won't be perfect all the time and that's okay. 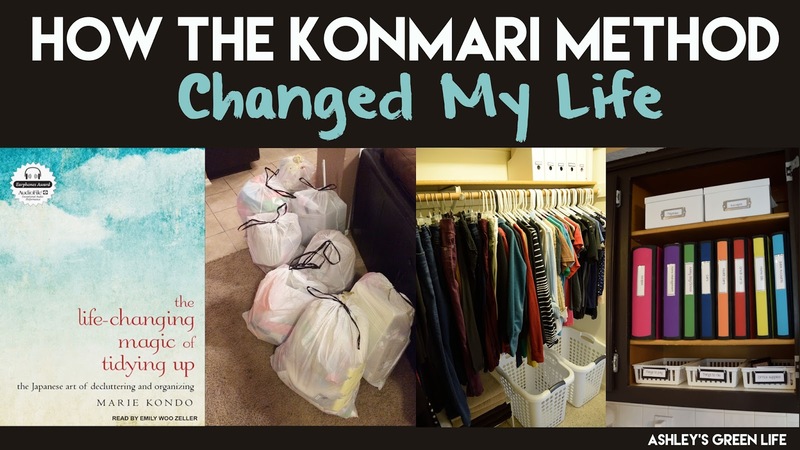 Well that sums up my experience with the Konmari Method and how it has helped change my life, my house, and all of my belongings. 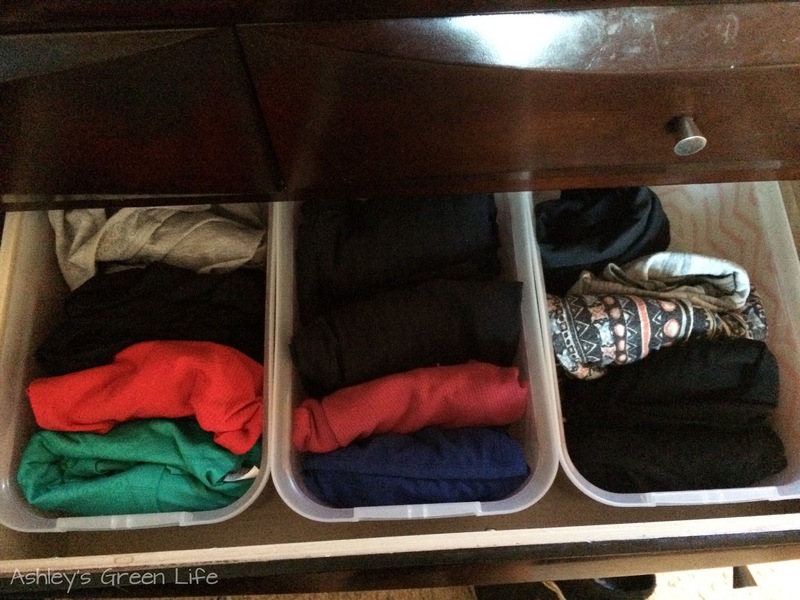 If you have ever read The Life-Changing Magic of Tidying Up by Marie Kondo, share your experiences below! Be sure to check out my other post on this topic about how I'm applying the Konmari Method with my kids here!